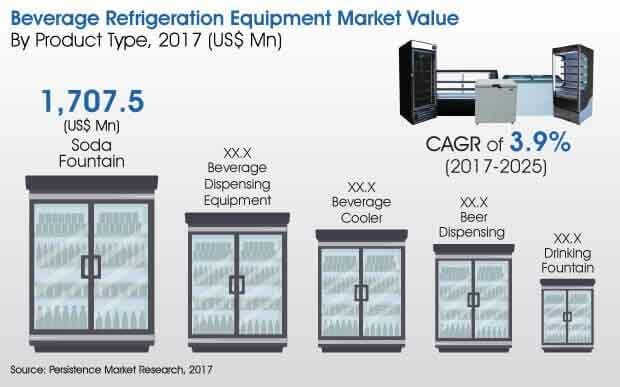 Our new report on the global beverage refrigeration equipment market focuses on the trends driving the adoption of this equipment over an eight year period from 2017 to 2025. The uniqueness of this report lies in the accuracy and credibility of the researched data and analysis. Our team of analysts have covered validation, product mapping, segmental revenue as well as company financials. Company share analysis represents the market share of manufacturers and suppliers of beverage refrigeration equipment based on their segmental revenue and product offerings. Market share analysis is subject to volatility due to recent divestments, expansions and mergers & acquisitions of players in the market. Our report on global beverage refrigeration equipment market encompasses volume sales and also the value generated from the sales of beverage refrigeration equipment. The scope of the report will also include beer and beverage dispensing equipment, drinking fountain, soda fountain which find application in supermarkets, wine shops, bars, etc. The scope excludes ‘walk-in’ type of refrigerators. We have validated the data through several primary interviews with industry experts and exhaustive secondary and primary research. The product mapping of beverage refrigeration equipment manufacturers in the respective business segments of the company has been done to give the crystal clear market share scenario to our existing and potential clients. We have also mentioned the breakdown of the overall key players’ businesses into segments under which they operate in the global beverage refrigeration equipment market. Accordingly, we have also calculated the annual revenue for each segment. Recording and analyzing overall annual revenue of key beverage refrigeration equipment manufacturers is carried out for the year 2017 on the basis of annual reports and secondary research. When developing the market forecasts, we started by sizing the current market, which forms the basis for forecasting and also explains the market scenario and performance in the future. We have considered product-wise weighted Average Selling Price (ASP) to deduce market values at a regional level. We have used the bottom-up approach to counter-validate the reached numbers and end-use industry application-wise market numbers. Simultaneously, top-down approach has been used to assess market numbers for each vehicle type. Macroeconomic indicators, such as GDP, manufacturing sector growth, global trade statistics and household final expenditure have been considered. All values for market size are in US$ Mn (US Dollar-Million) and volume data is in units unless specified otherwise. We have adopted systematic research approach while inspecting this report. In-depth secondary research is used to arrive at an overall market size, top industry players, top products and industry associations. Our analysts have formulated a detailed discussion guide in order to conduct expert and industry interviews. We also have conducted interviews with industry experts, industry players, distributors and retailers. Data is validated by triangulation method, wherein primary, secondary research and our unique analysis contribute to the final data. We have also analyzed various companies and their annual reports, investor presentations, SEC filings, reports and press releases, operating in the beverage refrigeration market to fetch substantial information about the market size, different trends, growth opportunities, as well as drivers, and restraints. The beverage refrigeration equipment market growth is influenced by various food and beverage retail stores that use the equipment. It comprises different product types like drinking fountain, soda fountain, beverage dispensing equipment beverage coolers etc. All these equipment are either used for dispensing liquid or for refrigeration of beverage bottles. According to the analysis of global beverage refrigeration equipment research report, among all the equipment, soda fountain holds the highest market share with an expected market value of over US$ 2,200 Mn by the end of 2025. However, in terms of growth rate, beer dispensing equipment is expected to grow at the highest value CAGR of over 4.7% during the forecast period. The products are expected to witness many new trends including increasing awareness regarding green technologies among consumers which may lead to rapid replacement of conventional beverage refrigeration equipment over the next few years. The demand for all equipment is expected to rise mainly due to increase in number of retail stores in the market. In turn, it will result in increased expenditure on beverage refrigeration equipment. A positive change in the living standards along with an improving macroeconomic scenario has led to a significant upsurge of various organized retail stores across the world. The rapid growth of the organized retail sector characterized by the increasing number of hypermarkets and supermarkets is expected to boost the growth of the overall food chain, which in turn is expected to boost overall sales of refrigerated display cases. The change in lifestyle has also impacted the preferences of people. There is a visible increase in the demand for storage of packed beverages, which has increased the adoption of refrigeration equipment on a large scale. There has been a significant increase in the consumption of refrigerated drinks. The consumption of canned/preserved, chilled, beverages continues to grow; the reason being, more consumers are looking for cost-effective as well as convenient alternatives for drinks. People are also attracted towards quick serving restaurants. As people demand for packed beverages they intend to get the services quickly. There has been an increase in the number of quick service food restaurants outlets. Furthermore, consumer spending on eating at quick service equipment increased by 4.1% between 2005 and 2015. As a result, domestic and international companies are making major investments in quick service restaurants. Companies are focusing on the deployment of self service for beer, soda dispensing. Panasonic Corporation is a multi-industry company that manufactures products and provides solutions to the electronics, automotive, energy and residential sectors. The company holds a solid brand name in the market and provides 10,000 different types of products. The company’s past developments are helping it stand out in the global beverage refrigeration equipment market. In 2016, Panasonic was reported to have set up a refrigerator manufacturing facility in India. It also delivered its carbon dioxide refrigerant-based condensing unit to Jaya Grocer’s Mutiara Tropicana store in Malaysia. Jaya Grocer is the first super market chain outside of Japan to equip itself with Panasonic's environment-conscious commercial condensing units. Panasonic’s focus on eco-friendly products will also drive its future market growth. Market analysis suggests that Panasonic marked a revenue share of over US$ 69.7 Bn by the end of 2016.